Thinking of consulting? Want to earn more from your clients? Discover how to set your consulting fees and get more money from every contract. Influence the way existing and potential clients view you and your consulting business by analyzing your market and using your fees as a marketing tool. Calculate your rate using consulting fee models. Navigate sticky situations – like requests to cut your fees, negotiate your quotes or work for free. 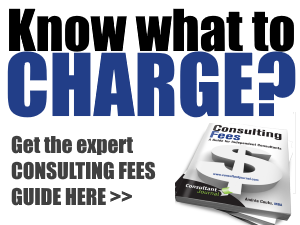 Andréa Coutu’s Consulting Fees Guide helps consultants calculate consulting fees that they can ask for with confidence. Figuring out how to set your consulting fees can seem like a daunting task. But after reading this updated and expanded 212-page PDF, you’ll have the tools to work out a strategy for your pricing and calculate your fees accordingly. Find out what prospective clients really want when they ask you to do spec work, meet over lunch or work on commission. Discover how to make more money and get paid faster without raising your fees. And now, in our all-new section on Solution-based Fees, find out how to work through the blocks to asking for fees that reflect the value of the solutions you offer. Would you like to understand your unique position and set your consulting fees for maximum gain? Order Consulting Fees: A Guide for Independent Consultants and charge a great hourly rate. Working through emotional and business blocks to asking for Solution-based Fees. With this guide to setting consulting fees, you’ll have the tools to work out a strategy for your pricing and calculate your fees accordingly. + Bonus Section: a directory of online consulting associations! Consulting associations often collect information on the fees their members charge. Order Consulting Fees: A Guide for Independent Consultants. For just $39, you’ll have more than 200 pages of information on setting, negotiating and getting consulting fees. Click the order link below now. [PDF and .mobi delivered instantly via email] You can read the ebook using a PDF Viewer like Adobe Acrobat or use your ereader to open the .mobi file. WANT IT IN HARD COPY? If you prefer a print version of the book, you can order from Amazon here or from Barnes & Noble. But if you order the ebook through one of the links below, you’ll also get bonus content not available to those who buy elsewhere. ORDER CONSULTING FEES: A GUIDE FOR INDEPENDENT CONSULTANTS – YOURS NOW FOR JUST $39. This guide is well worth the price and I often refer back to it to fine-tune my approach to setting and maximizing my consulting fees. I am completely satisfied and would recommend Andrea’s guide to other consultants”. – Consulting invoice template – a customizable template for invoices in Excel, Word and RTF formats, complete with instructions. All that and Consulting Fees. Yours now for $39. System Requirements: You will need a browser, Acrobat Reader and, for audio files, an MP3 player. As a seasoned employment attorney, I was seeking an opportunity to expand my practice and expertise in the realm of consulting. Andrea’s guide was (and is) an invaluable resource in diversifying my practice. I highly recommend her guide to any professional interested in taking a different direction with his/her career. Her advice on setting up a new practice/strengthening an existing consulting practice, pricing considerations, identification of “good” clients, and marketing appropriately is concise, clear and simply outstanding. Still not convinced about my Consulting Fees guide? You’re a reasonable person and you’ve heard about Internet fraud artists. Perhaps this is the first time you’ve ever made an online purchase — and you’re a little unsure. Your order will be processed via my secure server. (Always look for the https in the URL when you’re placing an order — it means you’re using a secure server.) My orders are handled with total integrity by PayPal, one of the world’s most recognized payment processors. This company handles $11 billion in transactions from 155 million accounts every year! Once they get your order, they send my website the information and your email with the PDF goes out automatically. They’ll process your order in seconds…which is all that’s keeping you from reading Consulting Fees: A Guide for Independent Consultants. You get Consulting Fees: A Guide for Independent Consultants — all 200+ pages! Plus my audio gifts – The Three Things You MUST Do Before You Move to Solution-based Fees and Overcoming Objections. After your order, you’ll instantly receive the guide. PS: If you contact me before the end of this month, I’ll include a copy of 50 Ways to Jumpstart Your Expert Status. Just place your order and then send me an email to let me know you want the free report. Consulting Fees: A Guide for Independent Consultants™ helps consultants with setting their rates. “Consulting Fees: A Guide for Independent Consultants” is a trademark of Andrea Coutu and Consultant Journal.